You Save: $15.00 (75%) Ships in 1 day. Soft Cover, 128 pages, 6x9. 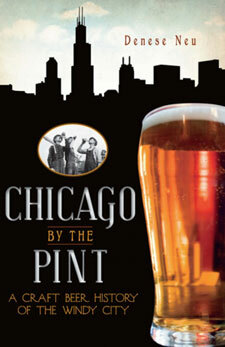 Chicago's craft beer scene may be new, but it enthusiastically taps the rich history of its home city. Order yourself a pint of Piece's Golden Arm Ale and meet its inspiration -- Nelson Algren, poet of the Chicago slums and author of The Man with a Golden Arm. Or sample the fine flavors of Crown Brewing, made in the former boiler room of a jail that was the site of a John Dillinger prison break. Slip some rough-and-tumble stories into your drink at Mickey Finn's or raise a glass of Honkers to Goose Island for bringing brewing back to the city. Through the pages of this amiable bar stool reader, experience some of Chicago's most fascinating stories, from the Great Fire to Wrigley Field.